To start I want to tell you that I was comped for this meal. I was contacted a couple weeks ago, asked if I would be interested in trying out the new service and told I’d be given a gift certificate for a certain dollar amount. There were no requirements for accepting this offer – and if there had been I wouldn’t have accepted the offer. But there were none at all. Now, I’m not naive. I know the person making the offer hoped I would blog about the experience – any publicity is good publicity, right? And obviously, I am writing about my experience. But my post is what I would have written whether I was invited or if I had gone in on my own. Still, I wanted you to know. Now on with it! 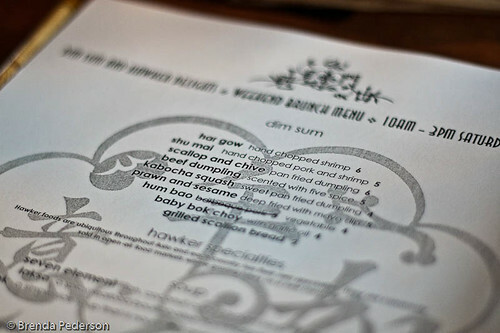 Last weekend the Wild Ginger at the Bravern began offering dim sum service on Saturday and Sunday mornings. They’ve also added several Asian "hawker-specialties" (street food) to their morning menu. In case you have not yet been to any meal at Wild Ginger you should know that their lunch and dinner menu borrows widely from several Asian cuisines. Their website indicates their food is from "the Eastern Pacific Rim from China to Indonesia, and Malaysia to Vietnam". And it seems that some of the dishes are fusions between these cuisines. So the new street-food is not from one specific culture but many. Three friends and I arrived on Sunday, the second day of this new service, looking forward to dim sum. We are a dim sum loving group and were anxious to see what Wild Ginger would offer. Traditional dim sum is not really served from a menu, instead, servers (normally ancient women, it seems) push little carts around the room, stopping at tables to offer items from their cart. Each table has a tally sheet and as the servers leave items at your table they make hash marks on the sheet. This sheet becomes your check. As I mentioned a few posts ago, most of the time I don’t even know the name of what I’m ordering. I just point to the things I recognize or want to try and they are placed on the table. So that was the first point of divergence at Wild Ginger. Dim sum is ordered from the menu. And I actually got to know the names of what I was ordering! 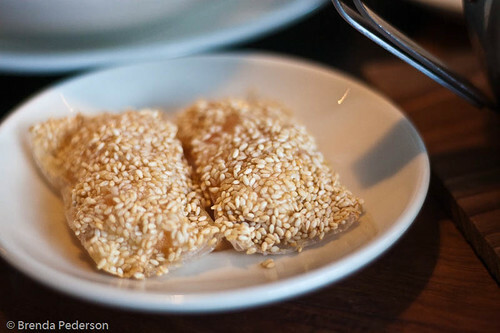 The list of dim sum plates is short but includes many of my favorites and offers a couple things I’d never had before. The preparations are classic. Since there were four of us we opted to order one of everything, except the hum bao. I also convinced the group to try one item from the Hawker Specialties menu, a soup called Seven Element. 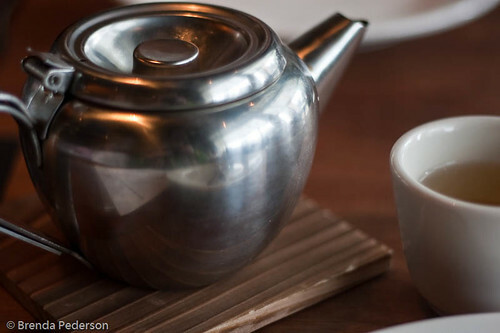 A couple of us also ordered pots of tea – what would dim sum be without tea? The first dish out was a grilled scallion flatbread. We all loved it. 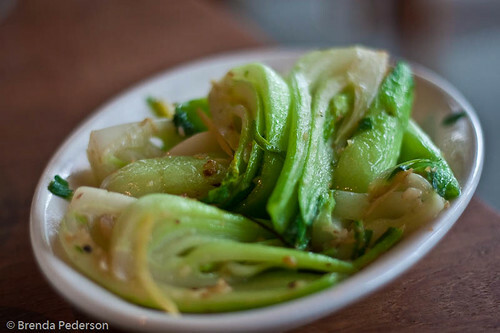 The taste of scallion permeated the crispy bread making every bite exceptionally flavorful. There was a little gap in the service while we waited for the other dishes to be served. The soup arrived next. Technically it was a soup but it was so filled with delicious noodles that it hardly qualified as soup. The noodles sat in curry turmeric broth that we all wanted to bathe in, it was so good. They brought us bibs for the soup, since the turmeric would stain if it got on our clothing. After a bite or two none of us really cared. 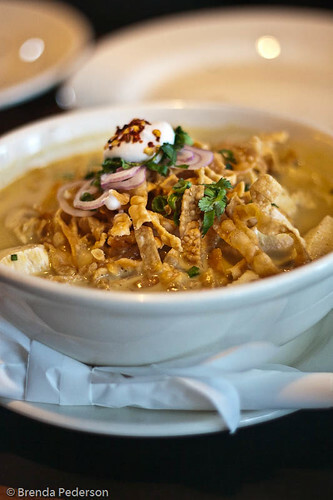 Big chunks of chicken, scallions, shallots, cilantro and the most gorgeous noodles made up this bowl. We’d just started professing our love for the soup when the other dishes began arriving. Everything else came at once, which is both good and bad. 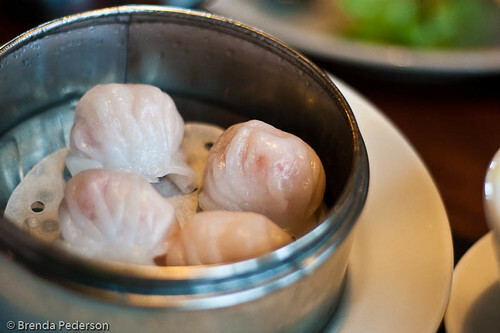 Normally dim sum is rather leisurely with the way it’s served. You pick a couple of dishes off a passing cart, then you may skip a cart or two before selecting another couple of items and on it goes. However, that can also lead to eating too much of something at the beginning and not leaving room for something you really wanted later on. So getting it all at once solved that problem but also led to a flurry of passing and sharing dishes. The food was very good. A couple of items were exceptional. I really loved the beef dumplings scented with five-spice and the deep-fried prawn and sesame pillows were a table favorite. It was the second day of service so there were timing issues that need to be worked out and our server wasn’t well versed in which sauces were supposed to go with which items. But these were relatively minor issues in the scheme of things. If I lived on the Eastside I could see myself popping in for this service on a fairly regular basis. I could stop in on my own for a couple of dim sum plates or sneak in a few items while friends ordered other dishes for brunch. I probably would not, however, make this a dim sum destination with a group. Call me old fashioned but I need the ancient ladies pushing the carts around the room to feel like I’ve had dim sum. While I liked knowing the names of what I’d ordered, I really enjoy seeing something new and just pointing to it, not sure if it will be a culinary discovery or disaster. This experience was too safe for me. One very pleasant surprise was that the bill, if we had paid it, would have been pretty much the same as the cost of dim sum in the International District. Maybe a little bit higher but barely. The difference was probably due to the charge for tea here while it’s complimentary for most dim sum service. That’s a pretty small difference. If you are in the area, definitely give it a try. If the sometimes dingy and generally packed rooms in the International District make you uncomfortable this might be just the place for you. If you don’t really care for cart service you also might enjoy this version. But if you like the circling carts and the ancient ladies this may not be the place for you.